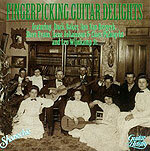 CD review: "Fingerpicking Guitar Delights"
This album isn't just country; it's country and a whole lot more. Dedicated to solo and duo acoustic guitar music, "Fingerpicking Guitar Delights" is a collection of traditional and contemporary country, folk, blues, bluegrass and Cajun songs performed with skill and aplomb by a cast of six stellar guitarists. Designed for budding musicians and part of Shanachie's Guitar Artistry series, "Fingerpicking" is still a very listenable album. In fact, ignore the booklet containing the musical notation for many of the songs, and you'd never guess this was a "how-to" album. The recording quality is stellar; it sounds as if you have a world-class guitarist in your living room. The four duets are even more incredible, with a perfect stereo mix (a lost art form, it sometimes seems with the murky mixing found on many recent releases). This is good stuff, with lots of fancy passages to delight the listener and challenge the student. Students will also be glad to know that once they complete this program, if anyone ever requests "Golliwog's Cakewalk" or "RAF Shuffle" then, by God, they'll be able to play it.